"In our medicalized age of diagnosis and disease, we have forgotten what it means to be a person. In this superb book, M. Guy Thompson returns psychoanalysis to its existential origins. Offering a sophisticated and shrewd exegesis of the phenomenology of desire and pathos, he humanizes suffering and situates therapy within a moral framework of embracing experience. Thompson succeeds brilliantly in advancing an authentic discourse on the human condition. "-Jon Mills, PsyD, PhD, ABPP, author of Inventing God. 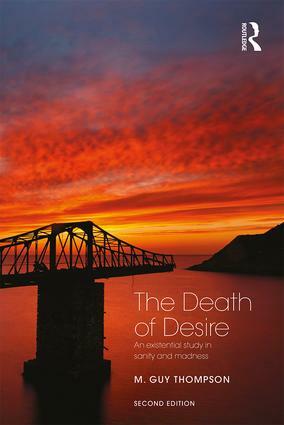 "Written with great clarity, insight and precision, this new, substantially revised edition of The Death of Desire by M. Guy Thompson invites its readers to reconsider their views on sanity and madness and the inter-connected role that each plays in our becoming who we are. Thompson's intent throughout is both radical and explicit: to excise from our understanding of madness all medically-attuned notions of pathology and, instead, to "return it to where it belongs: the everyday agony and ecstasy of living, in all its attendant mystery and complexity." This is a challenge whose boldness is matched by its urgent necessity. Whatever the stance taken towards the debate, I can't think of any mental health professional who will not benefit from reading this book. "-Professor Ernesto Spinelli, ES Associates, London, UK. "A compelling exploration of the madness in sanity and sanity in madness in existential depth psychological keys. Thompson, heavily influenced by R. D. Laing, amplifies links between existential and psychoanalytic insights in this fervent probe of the human condition. Whether or not you agree with particular points, your appreciation for who we are and what we are up against will grow. A much needed affirmation of the human spirit in all its vicissitudes. "-Michael Eigen, Ph.D., author of Image, Sense, Infinities, and Everyday Life. "M. Guy Thompson's revised edition of The Death of Desire is a clarion call for love – or "being with" – as the crux of psychological and psychiatric care. Interwoven with keen scholarly insights and compelling personal anecdotes, this volume provides a rare window into Thompson's many years as student and later colleague of psychiatric maverick R.D. Laing. Through both case vignette and personal observation, Thompson builds a powerful case for sanity (or the nurturance of desire, authenticity, and responsibility) in a maddening, sanity-depleted world. This book is probably more relevant now, given today's machine-mediated, medicalized ethos, than it was 30 years ago when the first edition was published. I couldn’t recommend it more highly." – Kirk Schneider, Ph.D., author of Existential-Humanistic Therapy, Awakening to Awe, and The Polarized Mind. "The Death of Desire is alive with the spirit of Laing with whom Dr. Thompson trained and worked. Laing would have loved this revised edition even more than the original. This wonderful book provides a unique, absorbing and insightful exploration into the varieties of human experience and how best to live today. Dr. Thompson’s open-ended, open hearted, and creative approach reflects his thoroughly existential philosophical approach to psychoanalysis. The book brilliantly illuminates crucial questions about love, authenticity, therapy, sanity and madness. "-Douglas Kirsner, Ph.D., Emeritus Professor, Deakin University, Melbourne; Honorary Member, American Psychoanalytic Association. "In these syncretic days of genetics, epigenetics, neuropsychology, and psychopharmacology, we seem to be losing the recognition that psychoanalysis is all about people struggling to make sense of and deal with devastating personal experience. M. Guy Thompson’s brilliant book recalls us to a time, thirty years ago, when British psychoanalysis was full of humanistic fervor. Object relations and existential psychoanalysis were revitalizing traditional psychoanalysis. This highly anticipated revision of The Death of Desire not only recaptures that period but also offers a fascinating personal account of the times, particularly R.D.Laing, its brilliant and flawed proponent. I enthusiastically recommend this engaging and accessible work, not only for psychoanalysts, but for anyone interested in understanding the human condition. "-Edgar A. Levenson, MD, Fellow Emeritus, Training. Supervisory Analyst and Faculty William Alanson White Institute. Adjunct Clinical Professor of Psychology , New York University Graduate Studies Division. Honorary Fellow Postgraduate Center for Mental Health, Honorary member American Psychoanalytic Association. Life Fellow American Academy of Psychoanalysis; Distinguished Life Fellow American Psychiatric Association. 2006 Mary S. Sigourney Award. Author: Fallacy of Understanding; The Ambiguity of Change; The Purloined Self and over one hundred journal publications. "Michael Guy Thompson, in this important work, provides a much needed and updated interweaving of existentialism and psychoanalysis. Building on how both Laing and Lacan attempted to rescue Freud from sanitised, often behavioural misunderstandings, Freud as well as Laing are treated as both existentialists and psychoanalysts. The result is a very readable exploration, highly recommended for both the general reader and experienced therapist interested in the relationship between desire and the human condition. "-Del Loewenthal, Existential-analytic psychotherapist, Professor of Psychotherapy and Counselling, University of Roehampton, UK, author of Existential Psychotherapy and Counselling after Postmodernism. "In The Death of Desire, M. Guy Thompson takes the reader on a fascinating journey through the landscapes of psychoanalysis and existentialism. His search is for a deeper and more complete understanding of sanity and madness. Thompson provides a vivid and compelling depiction of key writings from Freud, Laing, Nietzsche and Heidegger; and shows how their works all form part of a single, unified landscape, at the heart of which is the need for love. This is the patient’s need to experience love in their life, which allows for the actualisation of their authentic possibilities; and the therapist’s capacity to facilitate this process through a caring, loving sympathy. This book is a valuable source of ideas and inspiration for therapists of all orientations, and particularly those working at the borders between existential and psychoanalytic therapies. "-Mick Cooper, Professor of Psychology, University of Roehampton, Author of Existential Therapies, 2nd revised edition. "An extraordinarily powerful book. As an existential primer for psychotherapists of all schools the book is a triumph. The wisdom available in difficult and popularly shunned thinkers, such as Nietzsche and Martin Heidegger, is made brilliantly accessible by Thompson. I cannot think of another book of this kind that is so consistently able to make complex ideas clear. This work has the authenticity, the aura of immediate human and clinical good sense, it seeks to describe. In the literature of psychotherapy, it is rare to find a book so moving as this, and so compelling in its humanity. "-William Kerrigan, PhD. "This is a thoughtful and in depth study of, and meditation upon, our thoughtlessness and lack of reflectiveness. Thompson brilliantly weaves his way through the thinking of Freud, Nietzsche, Heidegger, Kierkegaard, and others, who have pondered over the nature of human suffering. How come that we desire to be, what we are not and can never be? This book in an invitation not to desire to be — dead. Any psychotherapist (or anyone) who wants to consider what the therapeutic relationship is about will find this study both rewarding and illuminating."-R. D. Laing. M. Guy Thompson, Ph.D., is a Personal and Supervising Analyst at the Psychoanalytic Institute of Northern California and Adjunct Professor at the California Institute of Integral Studies, San Francisco. His most recent book, The Legacy of R. D. Laing (2015), is also published by Routledge. Dr. Thompson is the author of numerous books and journal articles on psychoanalysis, phenomenology, and schizophrenia. He lives in Marin County, California.